Continuing with this week’s theme of wrapping paper I have a few fun and crafty ideas for you. Who knew that I Love to Create wrapping paper? Gather up your cassette tapes, tacky glue and newspaper next time you have a gift to wrap and follow these easy instructions. My first gift wrap example was actually a happy accident when I made my lacey Hooptastical Earring Holder. 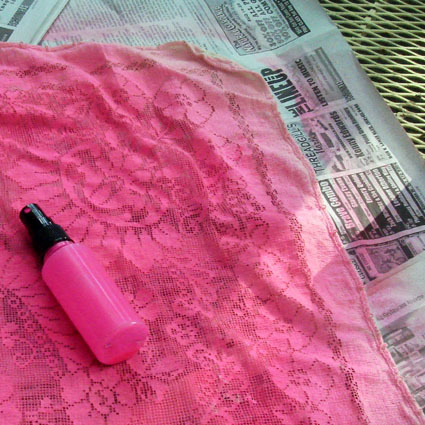 When I dyed the lace using Tulip Fabric Spray Paint unbeknownst to me I was creating neon pink wrapping paper at the same time. I used the newspaper (I was especially excited about the picture of Debbie Harry), aqua bias tape and a pom pom I made to adorn the gift I brought to a mustache themed birthday party! One of my favorite parts about the above gift was the Cassette Tape Pom Pom I whipped up instead of a bow. Making your own is as easy as a trip to the thrift store and the toilet. 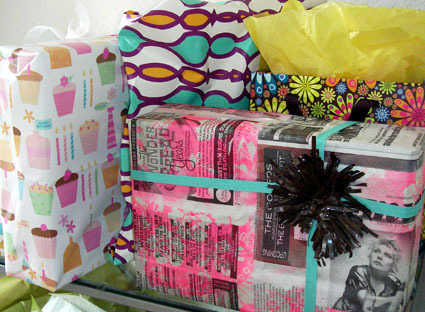 Remeber when you were in High School and would go wrapping? Well this is different, but toilet paper rolls are still involved. 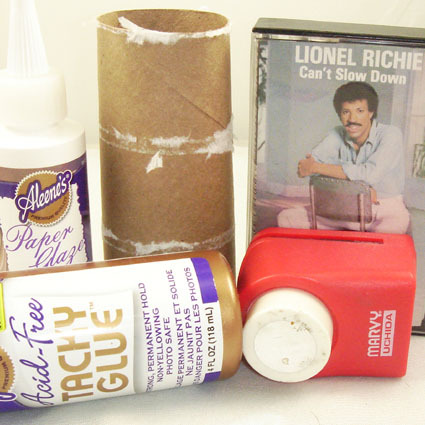 Cut the cassette tape and wrap around an empty tube of toilet paper several times. After you have a nice thick wrap around the roll slide the bundle off the roll. Use another piece of cassette tape to cinch in the middle, tie in a knot. Using your scissors cut the loops on either end of your pom pom. Fray the edges out a bit. Cut out a picture from the cover of your cassette tape. I used Aleene’s Paper Glaze to adhere my image to a hot pink disc. I then used Aleene’s Tacky Glue to attach the charm to the center of my pom pom and also attach the entire thing to my wrapped gift. 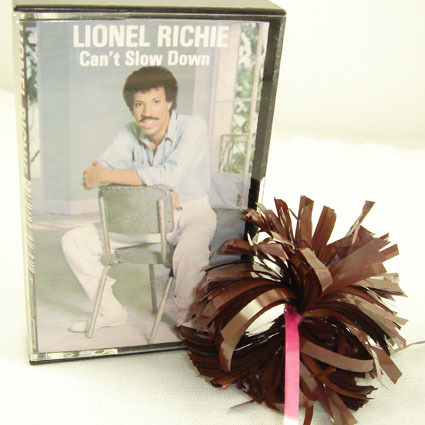 Can’t Slow Down is the album that had “All Night Long” on it so all that is left to do is make a handmade card that says “Lionel Richie wishes you a jumbo jumbo birthday”. 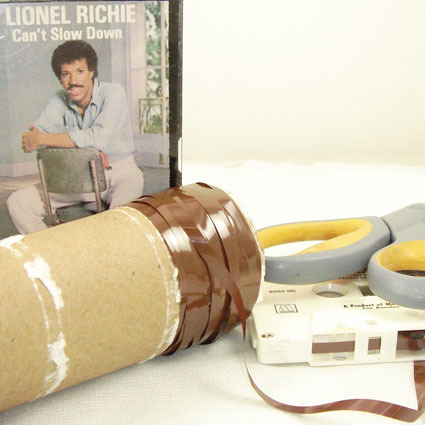 Since you know I love all music themed crafts, I have one more wrapping paper idea! Rip apart the record jacket, or separate the front from the back. On the back of the front side draw four straight lines with your ruler. The lines should be 2 1/2 inches from the edges. These are going to be your fold lines. Cut four tabs from the corner fold lines. These will make the flaps that fold in and get glued down. Fold over all four lines. The cover should be folding in to look like a box. 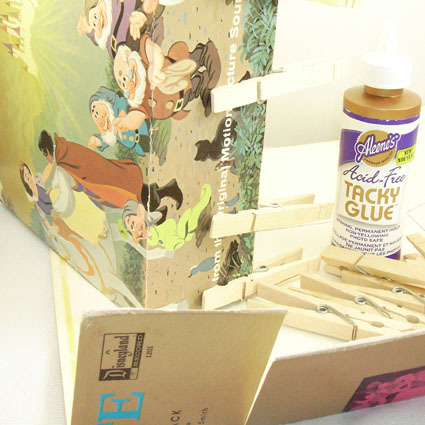 Start putting glue on the tabs and clothes-pinning them in place. Now wait over night! Repeat all 5 steps for the back part of the record jacket, except make the fold lines 2 5/8 inches in. See more how-to pictures here or pick up a copy of Pad: The Guide to Ultra Living. 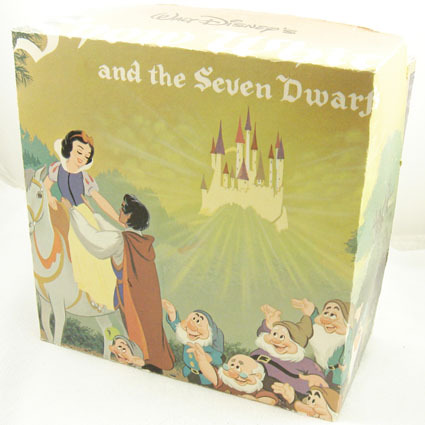 Who wouldn’t want to recieve a gift in this record box? 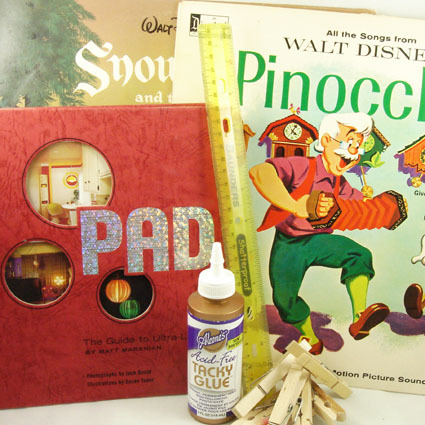 Plus you can reuse it to store little toys, puzzle parts or paper clips! Posted September 10, 2009 & filed under Crafts, Crafty, Holidays, I Love to Create, Music, Paper Crafts, Parties, Recycled Crafts. You know Mrs. Potter you are right! I should gather up my music themed crafts and put me together a book proposal. Thank God your here I never think of these things. Great ideas! Great use of those old tapes! I have Lionel around here somewhere too! I often wondered how to re-use cassette tapes, since I don't crochet or knit. Very cool! What a memorable gift wrapping! 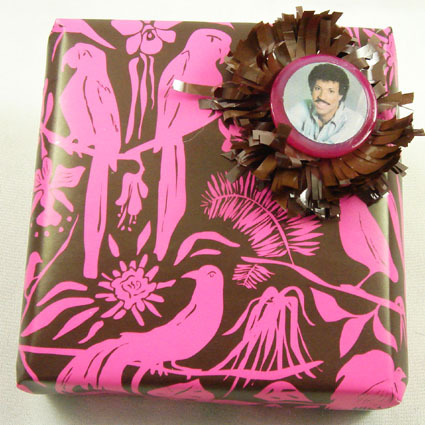 I would LOVE to receive a Lionel Richie(or just about any musician that had a cassette tape)bow. I wouldn't even care what was in the box. Now I need to remember to save even the newspaper I crafted over. Who knows when you will come up with an idea to repurpose it – yet again? !